There are times when good things happen. When those things happen it is always good to celebrate. May 29 - June 1 2014 was just the right time to recognize milestones and accomplishments in restoring the Uwharrie Trail to its original length. 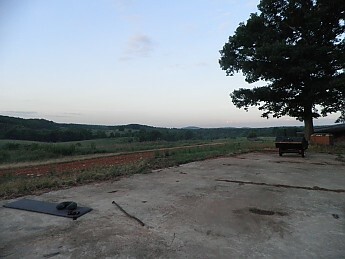 The Land Trust of Central NC has been working diligently for years acquiring land, easements and permits to complete the route and fill the gaps. I have had the pleasure to work a couple of Saturdays with the volunteers building sections of the trail. I must say I have found it to be a fulfilling experience. I look forward to future work days and hike days too! While the job is not 100% complete, there is plenty to see, experience and celebrate on the trail. 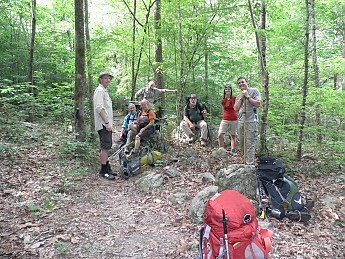 I had the opportunity to hike the full length of the trail with a group of people, most of whom I had never met before. This is an entirely new experience for me. It turned out to be one of my favorite trips. 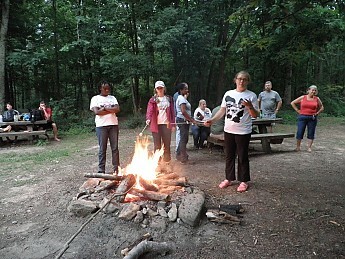 I really enjoyed spending time in camp and on the trail with everyone. 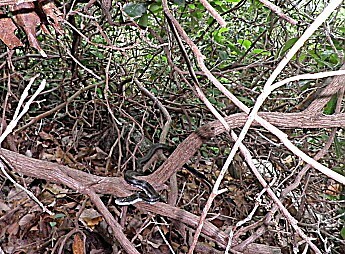 Early into the hike near the trail head we came upon this black snake in the laurels. I know some of these people from trail work and the others I had just met a couple hours before this photo. 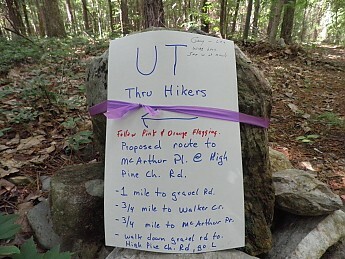 There were about 20 people in all who participated in the actual hike. 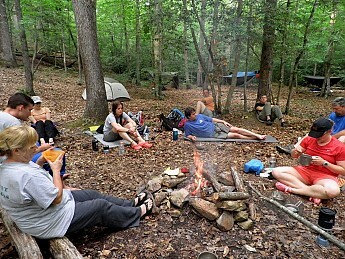 Camping at Yates Place. Not really roughing it though! More of the group after a day's hiking. Day 2 after a hard rain the night before. Getting some water early in the hike just across Dusty Level road. 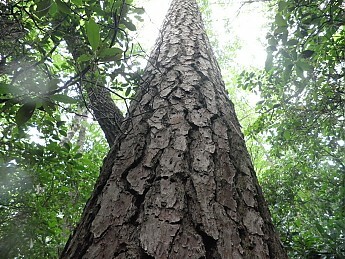 On this part of the UT there are some huge pines. I love big trees! Spencer Creek is a nice spot to relax. 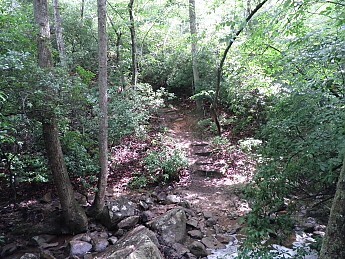 The only stairs on the trail. 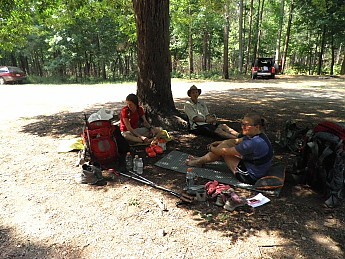 We had a great time camping on Panther Branch. A perfect end to day 2. 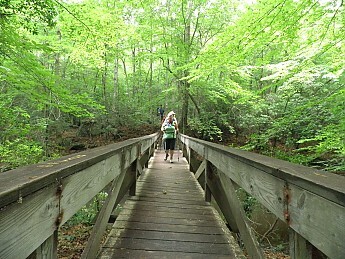 Day 3 was a perfect day for hiking, really no humidity and temps in the 70's. This turn is a proposed route. 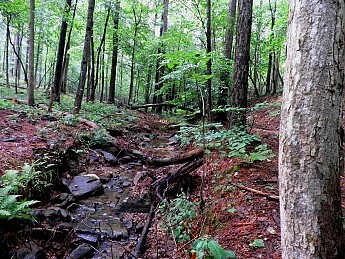 We turned off Dewey Luther Section and headed through the woods following ribbons down to Walkers Creek. 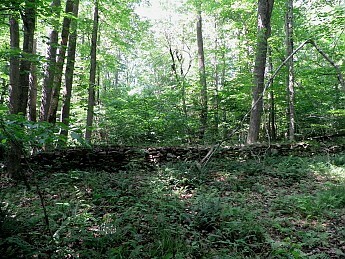 This old rock wall was probably for flood control. 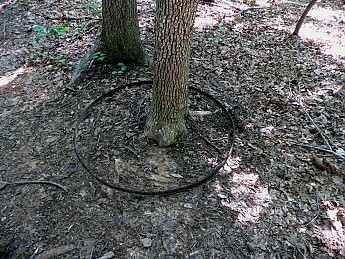 It stretched across on theother side of the creek too. None of us could figure out what this is. 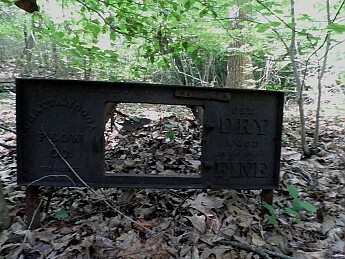 Some thought maybe a furnace or kiln perhaps? High Pine Church Road. 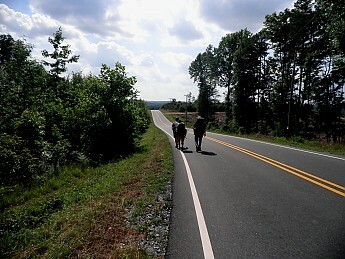 Leaving Walkers Creek, entering the road from a section known as the McArthur place. The McArthur place has some sheds there, still in good condition, now owned by NC Zoo in Asheboro. Ruth Ann's farm was lovely. Yes we had cake, barbecue, and beer lots of beer! 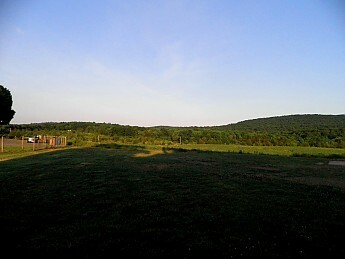 From here on the farm we could see all the way to Dennis Mountain. this is where we were on day 1! 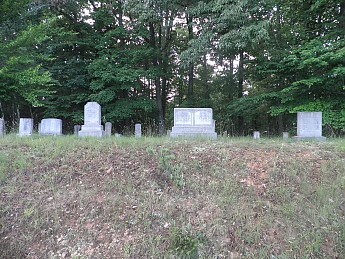 Thorneburg grave yard. 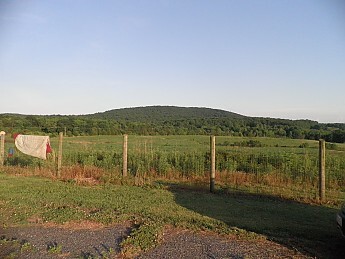 The USFS owns the Thorneburg farm north of here in Birkhead Wilderness. 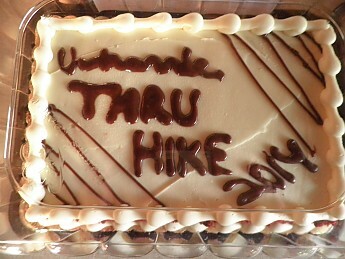 A great end to a perfect hike! Nice report Joe, thanks for sharing. I expect another when you get that trail finished! Awesome, God bless the people who work on the trails! 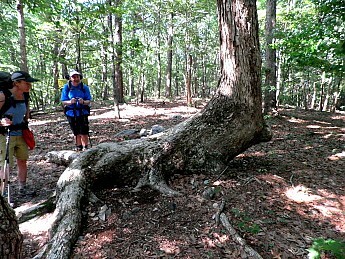 I never have done the North Carolina Uwharrie forest but I think I spent a few nights in Duke Forest on a long hitchhiking trip. So, thanks for the neato pics and report. Were you ever bothered by the off road vehicles in the area? I know part of the Uwharrie is dedicated to such nonsense. Thanks Everyone. Tipi Walter to answer your question, There are world class ORV trails, but they are a few miles up hwy 109 near Badin Lake. There are also equestrian trails in the same area with the ORV's. There are the occaisional scoff-laws that ride their horses, ATV's(less common) and mountain bikes (more common) on the hiking trails. Interestingly, I am usually greeted at the trail head by lots of parked vehicles, but typically see very few people after couple of miles in. I love trip reports with more pics than text! Thanks, Joe. That was an awesome trip. It was actually my first backpacking trip ever. There were great people and we had a great time. soleful2001 told me about trailspace.com on the trip and I joined up soon after I returned. this is an awesome site and the reviews are very informative! you all have a great site. Thanks Thomas, I had a great time too. I hope your first experience has encouraged you to take more trips. I enjoyed getting acquainted with you and the others and I look forward to another trip together soon. i am glad you found your way to Trailspace. This is truly a great resource.